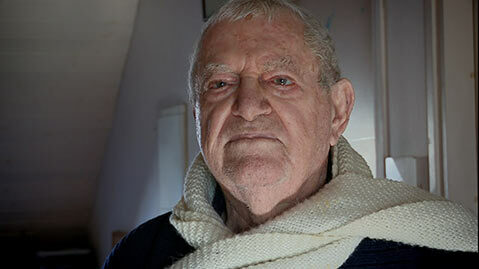 The final chapter in Christopher Sykes trilogy documenting the life and career of Palestinian-born Israeli producer/director Menahem Golan finds the flamboyant figure living in Jaffa, Israel and carrying on in his dream campaign to win an Oscar as an octogenarian. Golan, who died in 2014 at age 85 while the film was in post-production, clearly feels a deep affection for Sykes, whose two earlier films on him were at times satirical in tone. The intimacy Sykes achieves with his subject in this chapter lends the still fantastic ambition of Golan an added poignancy. What a project! When did you first get the idea that you might make more than one film about Menahem? Was he always so trusting and receptive to you? I made my first Golan-film, ‘The Last Moguls’, in 1986 when Golan and his cousin Yoram Globus had just bought up half the British film industry and almost everybody in movies seemed to be working for them – from Dustin Hoffman to Jean-Luc Godard! I made the second film, ‘Shooting Versace’, a decade later when Cannon had collapsed and Golan was trying to make a living with ultra-low budget movies like ‘The Versace Murder’ which he wrote and directed. On that occasion, he told me that if I didn’t show proper respect he’d have my wife and children killed. So no, he wasn’t always trusting and receptive! The idea for the third film was simple – whatever happened to Menahem Golan, mogul? Because I always thought, from the first two film, that he was an extraordinary character, far, far larger than life. And there he was, living at the top of his daughter’s house in Jaffa, writing scripts and dreaming of an Oscar-winner with Al Pacino. The vision of Hollywood filmmaking offered in this film is both clearly skewed by Golan’s uniquely fantastic perspective, yet he also somehow seems a true product of the commercial feature film world, “Mr. Cinema.” To what extent do you see him as a representative type of the producer/director? In what ways does he depart from the norm? I haven’t been up close and personal to many Hollywood producers, but I can imagine that Menahem shared many character-traits with the best of them: a huge passion for cinema, a real respect for talent and pleasure in exploiting it — the love of the deal, and genuine satisfaction if the thing comes off, financially and, if possible, artistically (in this case, rare). My impression is that Menahem never really understood Hollywood, but he did – for a while – understand how to make money, and Hollywood was – for a while – impressed by that. What sorts of challenges did the location and the circumstances of this chapter of Golan’s story pose? How did you manage to make this film and keep the rest of your life and career going? Like Menahem at the time I went to Jaffa to see what he was up to, I was quite old (70) and so I could afford the time to make the film in a leisurely way — it was self-financed and I had not deadline from a commissioner. The challenge for me was shooting and recording it all by myself (which I wanted far more for the intimacy I was after rather than for economy), and also the great challenge of how to make a sympathetic portrait of Menahem. I’d had my fun with him in the other films but now he was old and frail and I thought something quite different was called for. Any other thoughts about what motivated you to pursue the farewell of Menahem Golan as the subject of a documentary? Is there a poignancy to Golan’s last days for you? This time I came to understand that Menahem’s passion for cinema was real and deep and went back to his childhood. He had genuine artistic longings that, sadly, he never realised –except, perhaps, through some of the great directors he backed. The thing that really got to me was how he never stopped trying, never gave up, never stopped dreaming until the night he dropped dead in the street in Jaffa.